Make sure your users can not only find what they want, but are able to also share such content onto their wider social networks. Everything is share-enabled by default, which creates valuable traffic from social media sites. eDirectory integrates seamlessly with all the major social platforms. Be assured that with us, you're already ready to compete with others on social media from the start. Connect your Facebook or Google + account with a few clicks in the site manager, and you're all set to go. Users can seamlessly share or like your content across the major networks. Display your Twitter feed directly on your site. It's as simple as adding your Twitter username to our systems. The Sponsor section features social sharing links to entice listing owners to share their listings to drive traffic and reviews. 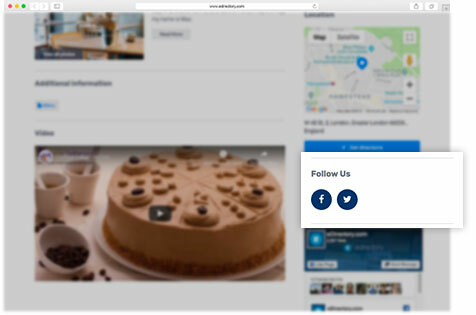 To help drive engagement around your directory site, the Visitor Profiles feature an optional link to their social media accounts. eDirectory features the ability to login with Facebook or Google+ accounts, making it easy for sponsors and visitors to create their profiles, and for your site to stay socially connected.